Environmental scientists at the U.S. Department of Energy's (DOE) Brookhaven National Laboratory have led an international collaboration to improve satellite observations of tropical forests. Responsible for nearly one-third of the world's terrestrial photosynthesis, tropical forests are a critical biome for examining climate change and its potential impacts across the Earth. "If we can improve our understanding of how much carbon dioxide (CO2) is absorbed by tropical regions, we can improve future climate projections," said Jin Wu, a scientist at Brookhaven's Environmental & Climate Sciences Department. Satellite images are one of the most common tools scientists use to observe tropical forests, but the efficacy of the method has been a subject of debate. 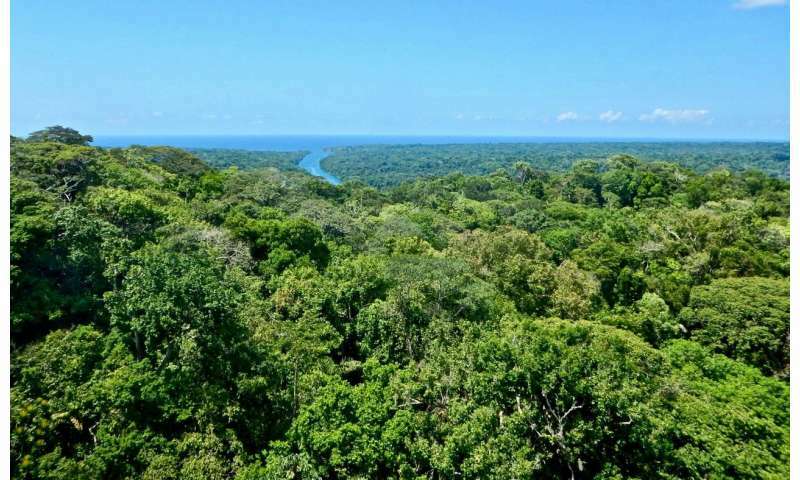 Some researchers have argued that seasonal changes in the "greenness" of tropical forests, as satellites have recently shown, could be misleading. Now, the collaboration led by Brookhaven has used field observations and computational models to help clear up the controversy. Their results, published on Feb. 9 in New Phytologist, also shed light on biological processes that have changed scientists' understanding of seasonality in tropical forests. Satellites take wide, sweeping images of the Earth's surface to image the global tropical biome. Captured routinely, these satellite images allow scientists to observe changes in the treetops throughout the year. Changes in the canopies' greenness can indicate how much light—and therefore, how much CO2—the trees are absorbing. Yet, because these satellites take images so far above the treetops and collect data over large areas of forests, the resolution is too low to identify why these changes are occurring. "One pixel in a satellite image covers almost one square kilometer of forest. That's huge," said Wu, who led the study. "So, within this huge footprint, we cannot tell what kind of biological processes are occurring. That's why we integrated field-based data with the computational models, which track the interactions between light and leaves within a forest canopy, to advance our understanding of what is happening in these satellite images." With the help of professional tree climbers, the scientists collected field data on three factors that affect canopy greenness: the amount of leaves present, the age of the leaves, and whether the trees were deciduous (lose their leaves annually) or evergreen (retain leaves for more than one year). Overall, they found their field observations closely matched the satellite images, confirming the accuracy of the satellites. In addition, they quantified the influence of each of these three factors on canopy greenness. "In previous studies, scientists always assumed leaves are homogenously displayed within the forest landscape, but we found this is not true," Wu said. "Even in a tropical rainforest, we find that deciduous and evergreen trees can coexist. The same is true for seasonally dry forests. Moreover, the timing of leaf shedding varies between different deciduous trees, creating a large heterogeneity in leaf display over space and time." The growth of individual leaves is also unique to each tree. "Leaves actually behave similarly to humans," Wu said. "As we become older, our metabolic rate will change, and the same is true for leaves. When they are baby leaves, their photosynthesis rates are really low, and that means they can only take in very small amounts of CO2 from our atmosphere. When they become mature, they can take a lot of CO2 from the atmosphere. And when they become old, they take in less CO2 again. It's a convex response." That means the seasonality of tropical forests is far more complex than scientists previously believed. In future studies, scientists will need to consider the role of leaf heterogeneity in satellite observations to accurately analyze the climate's impact on tropical forests. To continue studying how the diverse ecology of tropical forests relates to climate change, Wu and his colleagues at Brookhaven installed a network of cameras at multiple sites in the tropics. Every day, these cameras automatically capture images of the canopy at different heights, enabling the Brookhaven team to conduct higher resolution observations of tropical forests. The cameras will operate for more than two years and capture two annual cycles of environmental changes. "Data from these cameras will allow us to directly see when new leaves grow or old leaves drop off each tree during the annual cycle," Wu said. "Now, we have leaf-level information from our field measurements plus the camera-based data to continue improving our interpretation of satellite observations and climate models to better project the future climate."